Waiting is so difficult. And living in a society of “instant” everything is only making it harder. Yet “active” waiting is even more difficult. It is so much easier while waiting to be passive, thinking that if anything is to happen, it will fall into our laps. Active waiting means we take the steps we can, keeping alert for the signs of a new day starting on the horizon. Active waiting means we are attentive to notice what sometimes is right in front of us. Have you ever longed for some answer to a question, some kind of provision for your needs, only to find that it was all the time in plain sight? We just didn’t notice. 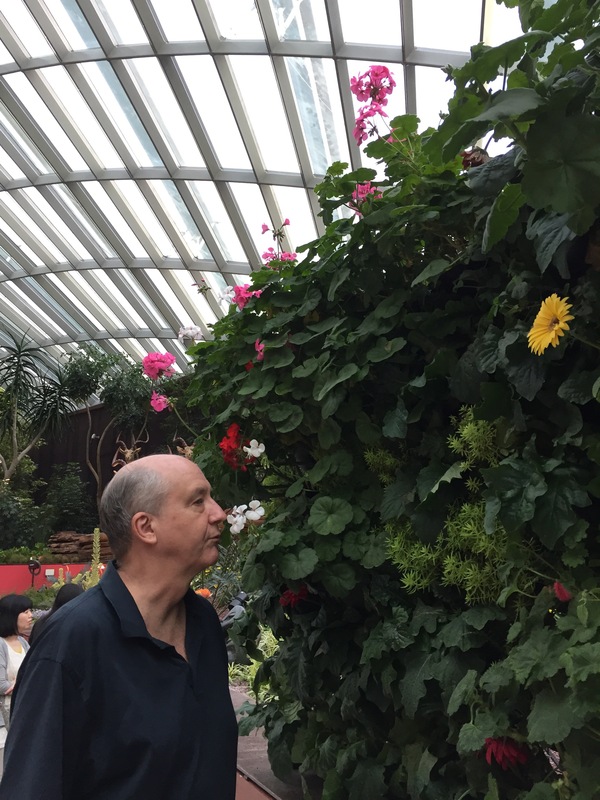 A few days ago while still in Singapore a friend took us to a remarkable place, the Flower Dome. It is a huge structure made of glass that is in effect the largest greenhouse in Asia, if not the world. Flowers from all over the world are grown and displayed there, including Tulips from the Netherlands and Cherry Blossoms from Japan. Just a stunning place. The fragrant smells are everywhere in the Flower Dome, and it would be easy to just walk around and take it all in. But I found myself needing to smell the flowers directly. (You even get to see a photo of me doing so!!) As I smelled the different flowers in all their luxuriant delights, I marveled at God’s creation and diversity of beauty. But I also noticed. I took a few moments to stop and be attentive to what was around me. This is active listening. This is active waiting. An “active dwelling in the present moment”. So much of life can be enriched by simply noticing the things around you, including the people placed right in your path, to love and cherish as precious gifts. Not as inconveniences and burdens, but as treasures. Perhaps the answers and courage you and I are seeking at this season of our lives, seemingly so elusive, are right in front of us, waiting to be noticed and seen with new eyes? Next Post Can you see the end of your life?